Mustard from Maastricht in four different tastes: herbs, dill, honey-thyme and hazelnuts from Limburg. This classic French Dijon mustard, is smooth and sharp. Perfect with meat and in vinaigrettes. A course and fine mustard, medium tart and fresh. A mustard that comes in four tastes with different textures. The Balsamic-honey, Bourgogne and Tarragon mustard are smooth. The cassis mustard is course. We have no less than four flavours in this mustard: cognac, nuts, violet-raisin and truffle. A course, mild mustard that can be royally dished out with a sturdy meal. 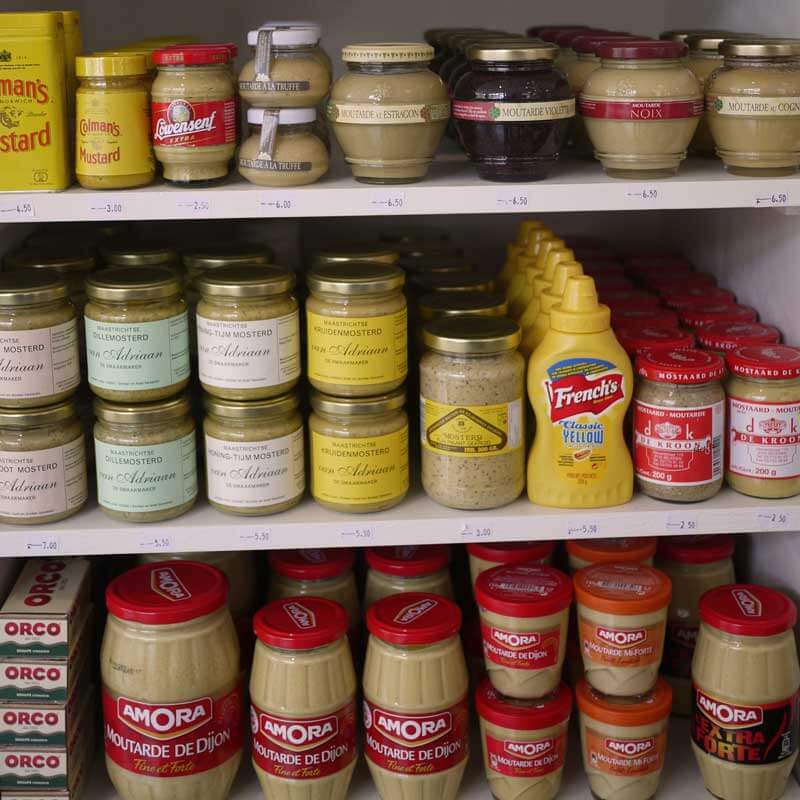 The famous Dijon mustard which is often used for dressings. The classic English mustard, yellow and sharp. A beautiful fresh mustard from Belgium. Lou Reed’s favourite mustard! A lovely earthenware pot, filled with a semi-course mustard. An organic, pink mustard, which has its special colour from purple carrot juice. A sturdy, fresh tasting mayonnaise from a small producer in Belgium. The French mayonnaise with extra mustard. 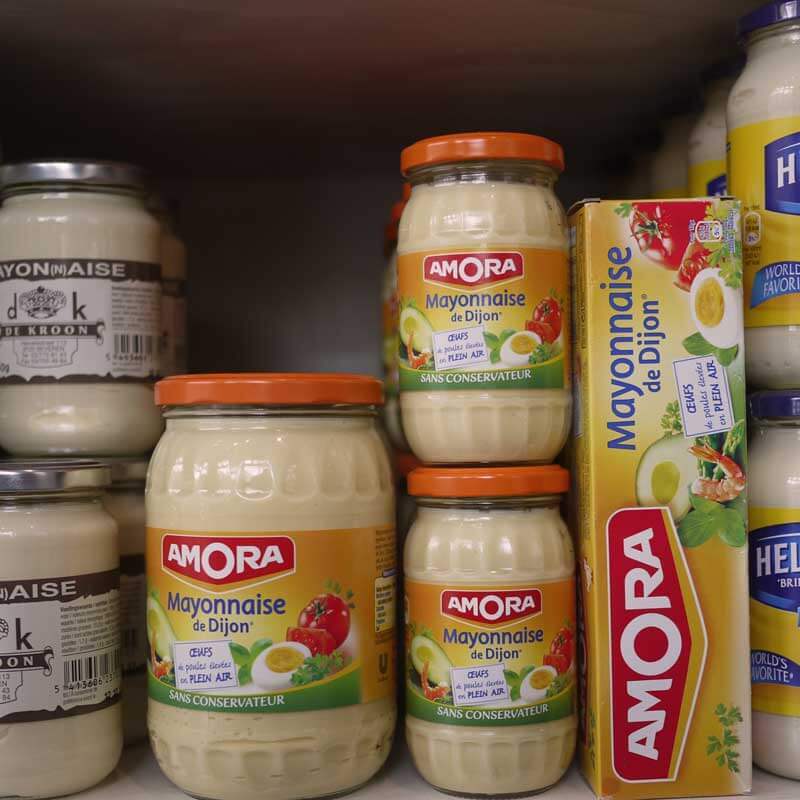 A typically French style Mayonnaise, with a lovely sour hint. The famous ‘Great American’ mayo, extra creamy. This mayonnaise isn’t a regular in our assortment, so when we have it make sure to grab this opportunity. According to some mayonnaise connoisseurs this is the only real deal when it comes to mayo.